What To Do > Colorado > Breckenridge Summit County > Shopping > Outlets at Silverthorne - Name Brands at Discount Outlet Mall Prices! 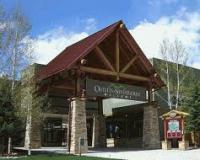 Offering a scenic and unique shopping experience in a beautiful Rocky Mountain setting all year long. Save 30-70% off an impressive collection of name-brand stores such as Williams-Sonoma Outlet, Nike, Polo Ralph Lauren, GAP Outlet, Coach, Banana Republic, J Crew, Eddie Bauer, Calvin Klein, Columbia Sportswear, Under Armour and more. Save even more at the 50+ outet stores with a FREE VIP savings card (see Coupons)! Located directly off I-70 in Silverthorne at Exit 205, 14 miles from Breckenridge. Activity - Name Brands at Discount Outlet Mall Prices!